Rifampicin (health system. It is available as a generic medication. The wholesale the cost is about 3.90 USD a month. In the United States it is expensive with a month of treatment being about 120 USD. Rifampicin is made from Amycolatopsis rifamycinica. Rifampicin is used in the treatment of tuberculosis and inactive meningitis along with other antibiotics which may include pyrazinamide, isoniazid, ethambutol, and streptomycin ("PIERS"). It must be administered regularly daily for several months without a break, otherwise, the risk of drug-resistant tuberculosis is greatly increased. In fact, this is the primary reason it is used in tandem with the four aforementioned drugs, particularly isoniazid. This is also the primary motivation behind directly observed therapy for tuberculosis. The  The decrease in rifampin absorption with food is sometimes enough to noticeably affect urine color, which can be used as a marker for whether or not a dose of the drug has been effectively absorbed. In 1957, a soil sample from a pine forest on the French Riviera was brought for analysis to the Lepetit Pharmaceuticals research lab in Milan, Italy. There, a research group headed by Piero Sensi and Maria Teresa Timbal discovered a new bacterium. This new species appeared of interest since it was producing a new class of molecules with antibiotic activity. Because Sensi, Timbal and the researchers were particularly fond of the French crime story Rififi (about a jewel heist and rival gangs), they decided to call these compounds "rifamycins". After two years of attempts to obtain more stable semisynthetic products, a new molecule with high efficacy and good tolerability was produced in 1959 and was named "rifampicin". Rifampicin was first sold in 1971. Rifampicin is the INN and BAN while rifampin is the USAN. Rifampicin may be abbreviated R, RMP, RA, RF, or RIF (US). ^ "Rifampicin (CAS 13292-46-1)". Santa Cruz Biotechnology Product Block. Santa Cruz Biotechnology. Retrieved 14 November 2014. ^ a b c d e "Rifampin". The American Society of Health-System Pharmacists. Retrieved Aug 1, 2015. ^ a b Oxford Handbook of Infectious Diseases and Microbiology. OUP Oxford. 2009. p. 56. ^ a b McHugh, Timothy D. (2011). Tuberculosis : diagnosis and treatment. Wallingford, Oxfordshire: CABI. p. 219. ^ "Rifampicin". International Drug Price Indicator Guide. Retrieved 24 August 2015. ^ Hamilton, Richard J. (2014). Tarascon pocket pharmacopoeia : 2014 deluxe lab-pocket edition (15 ed.). Sudbury: Jones & Bartlett Learning. p. 39. ^ Long, James W. (1991). Essential Guide to Prescription Drugs 1992. New York: HarperCollins Publishers. pp. 925–929. 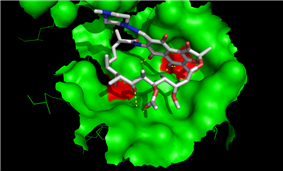 ^ Erlich, Henry, W Ford Doolittle, Volker Neuhoff, and et al. . Molecular Biology of Rifomycin. New York, NY: MSS Information Corporation, 1973. pp. 44-45, 66-75, 124-130. ^ Hofmann, AF (2002). "Rifampicin and treatment of cholestatic pruritus". Gut 2002;50:436–9 51 (5): 756–757. ^ "rifampin oral : Uses, Side Effects, Interactions, Pictures, Warnings & Dosing - WebMD". WebMD. WebMD. Retrieved 13 November 2014. ^ a b Sharma, SK; Sharma, A; Kadhiravan, T; Tharyan, P (July 5, 2013). "Rifamycins (rifampicin, rifabutin and rifapentine) compared to isoniazid for preventing tuberculosis in HIV-negative people at risk of active TB". The Cochrane database of systematic reviews 7: CD007545. ^ Aboltins CA, Page MA, Buising KL, et al. (June 2007). "Treatment of staphylococcal prosthetic joint infections with debridement, prosthesis retention and oral rifampicin and fusidic acid". Clinical Microbiology and Infection 13 (6): 586–591. ^ Wormser, Gary P.; Dattwyler, Raymond J.; Shapiro, Eugene D.; Halperin, John J.; Steere, Allen C.; Klempner, Mark S.; Krause, Peter J.; Bakken, Johan S.; Strle, Franc; Stanek, Gerold; Bockenstedt, Linda; Fish, Durland; Stephen Dumler, J.; Nadelman, Robert B. (1 November 2006). "The Clinical Assessment, Treatment, and Prevention of Lyme Disease, Human Granulocytic Anaplasmosis, and Babesiosis: Clinical Practice Guidelines by the Infectious Diseases Society of America". Clinical Infectious Diseases 43 (9): 1089–1134. ^ Thomas RG, Dumler SJ, Carlyon JA (August 2009). ehrlichiosis"Ehrlichia ewingii"Current management of human granulocytic anaplasmosis, human monocytic ehrlichiosis and . Expert Reviews in Anti-Infection Therapies 7 (6): 709–722. ^ "Rifampicin". Retrieved August 22, 2014. ^ Leschine, S. B., and E. Canale-Parola. "Rifampin as a selective agent for isolation of oral spirochetes." Journal of clinical microbiology 12.6 (1980): 792. ^ Charity JC, Katz E, Moss B (March 2007). "Amino acid substitutions at multiple sites within the vaccinia virus D13 scaffold protein confer resistance to rifampicin". Virology 359 (1): 227–32. ^ Sodeik B, Griffiths G, Ericsson M, Moss B, Doms RW (February 1994). "Assembly of vaccinia virus: effects of rifampin on the intracellular distribution of viral protein p65". J. Virol. 68 (2): 1103–14. ^ Collins, R Douglas. Atlas of Drug Reactions. New York, NY: ChurchillLivingstone, 1985. pp. 123. ^ Stockley, Ivan H. "Anticoagulant Drug Interactions." Drug Interactions. 3rd ed. Boston: Blackwell Scientific Publications, 1994. pp. 274-275. ^ Pugazhenthan Thangaraju, Hosanna Singh, M Punitha, VC Giri, MK Showkath Ali. (2015). "Hyperpigmentation, a marker of rifampicin overuse in leprosy patient: An incidental finding.". Sudan Med Monit 10 (1): 25–26. ^ "Division of Clinical Pharmacology | Indiana University Department of Medicine". Medicine.iupui.edu. 2011-09-27. Retrieved 2011-11-07. ^ Riss, J.; Cloyd, J.; Gates, J.; Collins, S. (Aug 2008). "Benzodiazepines in epilepsy: pharmacology and pharmacokinetics". Acta Neurol Scand 118 (2): 69–86. ^ Calvori, C.; Frontali, L.; Leoni, L.; Tecce, G. (1965). "Effect of rifamycin on protein synthesis". Nature 207 (995): 417–8. ^ Campbell, E.A., Korzheva, N., Mustaev, A., Murakami, K., Nair, S., Goldfarb, A., Darst, S.A. (2001). "Structural mechanism for rifampicin inhibition of bacterial RNA polymerase". Cell 104 (6): 901–12. ^ "Kinetics of Rifampin taken with food and with antacids" (PDF). Retrieved 2011-11-07. ^ Hardman, Joel G., Lee E. Limbird, and Alfred G. Gilman, eds. "Rifampin." The Pharmacological Basis of Therapeutics. 10th ed. United States of America: The McGraw-Hill Companies, 2001. pp. 1277-1279. ^ "When I Use a Word . . .I Mean It". British Medical Journal 1999;319(7215):972 (9 October). Retrieved 2009-07-10. ^ Moncalvo F, Moreo G (1966). "Ricerche cliniche preliminari sull'impiego di una nuova rifamicina orale (rifaldazina) nella terapia della tubercolosi polmonare (nota preventiva).". G Ital Mal Torace 20 (3): 120–31. ^ "Rifampicin". Chemical Safety Information from Intergovernmental Organizations. International Programme on Chemical Safety. Retrieved 14 November 2014. ^ "US Patent 3963705" (Patent). Google. US Patent Office. Retrieved 14 November 2014.